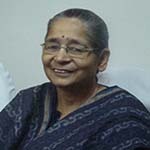 Pathak, Anamika is the Curator, Decorative arts and Textiles, at the National Museum in New Delhi, where she has worked for over three decades. She is a recognized expert and scholar in museology, decorative arts and textiles and archaeology. A student of ancient Indian history and Buddhist studies she participates actively in seminars, lectures and talks and has mounted several exhibitions at the National Museum and overseas. She is the author of ‘Pashmina’ and ‘Indian Costumes’, published by Roli Books, New Delhi.